The idea behind this spell is that by sending happy thoughts out into the world, you will find more happiness in the world. All you need is some bubble mixture and the ability to visualise things that make you happy. Go outside with your bubble mixture - ideally on a sunny day. Before blowing any bubbles, picture clearly in your head something that makes you feel good - it could be cupcakes and icecream, playful kittens, a rainbow after a storm or walking along the shoreline on a sandy beach - anything that fills you with joy and delight. Then, imagine you are sending those happy thoughts into the bubbles as you blow them. Do this for as long as you like, with as many joyful images as you can think of. 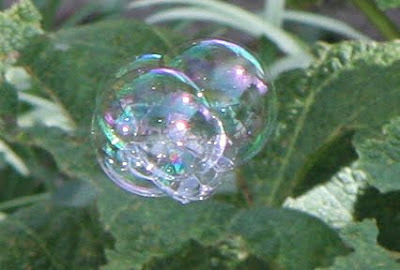 As the bubbles burst, happiness is released into the world, where it will grow. Some time in the future you will find a big bubble of happiness returned to you as something tangible in your life as a result of this spell. But don't go looking for the results. The secret of finding happiness is that it can often appear when you least expect it. You might think that the words are rather the opposite of the spell for happiness. That's sort of true - but it is a matter of perspective. The poem suggests that the bubbles of our happy dreams "fade and die"; whereas if you imagine that you are releasing them and sharing them with the world, then they don't die at all, but live and grow. And by desperately "looking everywhere" for fortune, it is easy to overlook or take for granted the simple pleasures of life that are present all around us, that can brighten our days and make the world a more magical place. Thanks for this. I thought this article was literally going to involve bubbles. I was happily mistaken. Ted, what's your problem with bubbles? The spell does involve blowing bubbles using bubble mix - which you can either buy from toy shops or make yourself. I'm no longer positive the place you are getting your information, however good topic. I must spend some time studying more or figuring out more. Thank you for wonderful info I was searching for this info for my mission.